Mariners Morsels - aka "Free Adam Moore and Rich Poythress! (George Sherrill is FREE! )": Goodbye Junior! 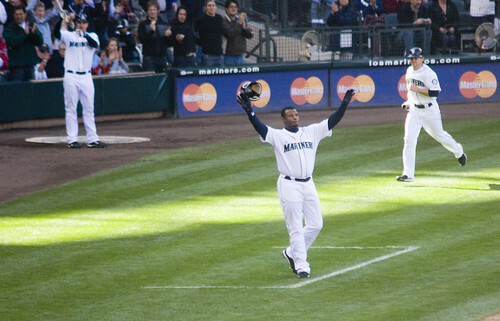 Today, Ken Griffey Junior retired from baseball. It was clear his skills had far diminished below his desire and as Jerry Brewer puts it, the last thing to be conquered was Griffey's joy. Some people will blame Larry LaRue's article. There's some logic in that - and it's unfortunate that the article burned a pretty big bridge between LaRue and Junior since LaRue was pretty much saying what no one else had the guts to say in the media (although the issue of controversy and bridge-burning lay more in the fact that LaRue brought to light Griffey's somewhat behind-the-scenes but not unknown habit of sleeping in the clubhouse during games). The smug complainers got their wish. Junior is no longer a problem on the M's roster anymore. Now they can shift their attention elsewhere and find a target for mean hatred. As I mentioned in my previous post, while I admit Junior was definitely a problem on the team his presence was far less of a problem than other more massive problems. Now we'll get to find out, I guess, if those cynics were correct. But, then again, the fact that Lopez and Figgins are finally starting to hit helps a hell of a lot more than Griffey's departure from the team that brought him from the cradle of his pro career to its grave. This is a dark, dark day in Marinerdom.